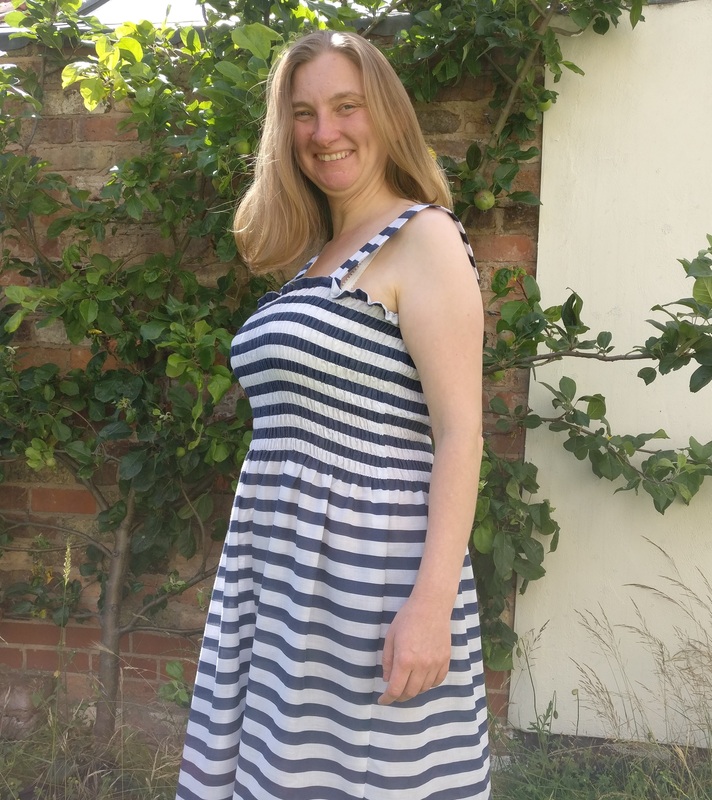 When I bought fabric for my daughters shirred dress I decided that it would also be useful practice to make a dress for myself following the adult version of the pattern from the Great British Sewing Bee Fashion with Fabric book. (OK, so I’ve had my daughter asking me for years why I don’t wear dresses more often, and I succumbed!). 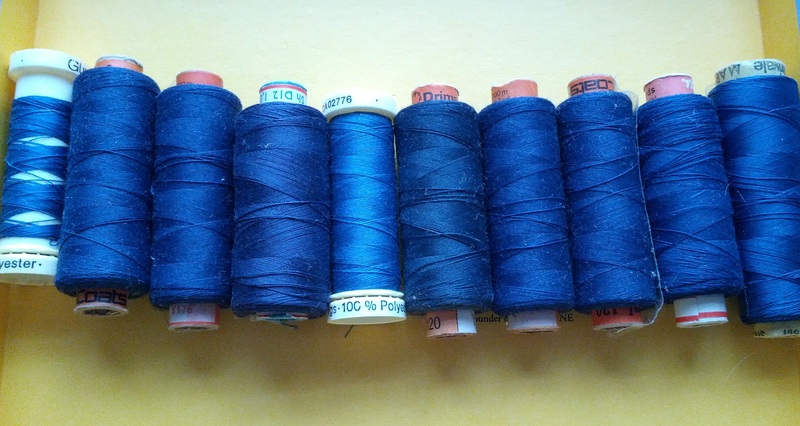 As such, I also bought 2m of some very cheap striped navy and white cotton (or poly cotton?) with the intention of turning it into such a dress. Six-months down the line, and I actually started this project. 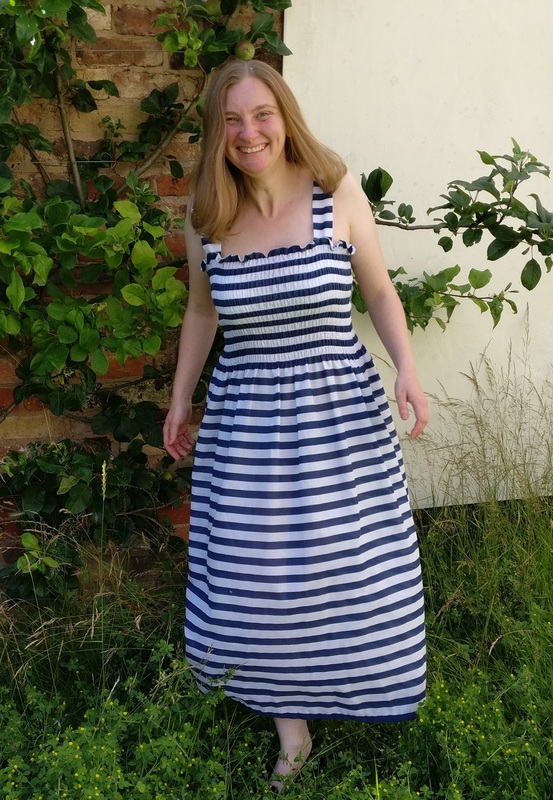 When I showed my husband the material to ask whether the stripes should be vertical or horizontal, he laughed, and said that it didn’t matter, as I was going to look like a deck-chair either way, so now it’s the deck-chair dress! Obviously the first step with any project is to wash the material, but I’m going to confess here, this is the first time I’ve actually done this, and yes, I did it because there’s been some slight movement on some of my previous makes. Well, at least I’m learning from my mistakes 🙂 Wow, am I glad I decided to wash this material! When I initially bought it, the white was stark against the dark navy, and the navy stripes were really stiff from the dye. After several washes (yup, several) I think the colour will no longer run – the navy isn’t quite so dark, and the white? Well, it’s not quite so white either. Now normally I would be disappointed about this, but this time, I’m quite pleased – the colours are slightly less stark and more gentle, so hopefully I look slightly less like a deck-chair than anticipated! My plan for this dress was always that it should just be worn around the house on hot days, as such, it doesn’t really matter that it’s not the most flattering shape for me, I just wanted something that was cool and comfortable. The ladies version of the pattern was pretty close to what I wanted, but I always wear a bra, and I don’t like bra straps to show. 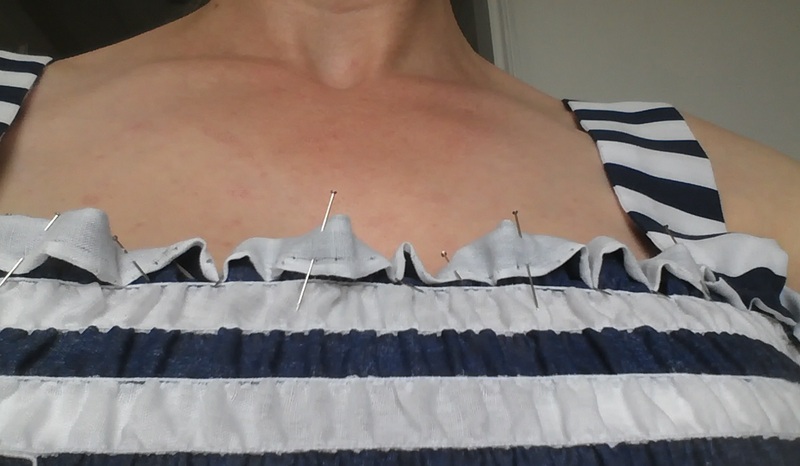 I therefore decided that instead of the spaghetti straps I would go for wider straps. 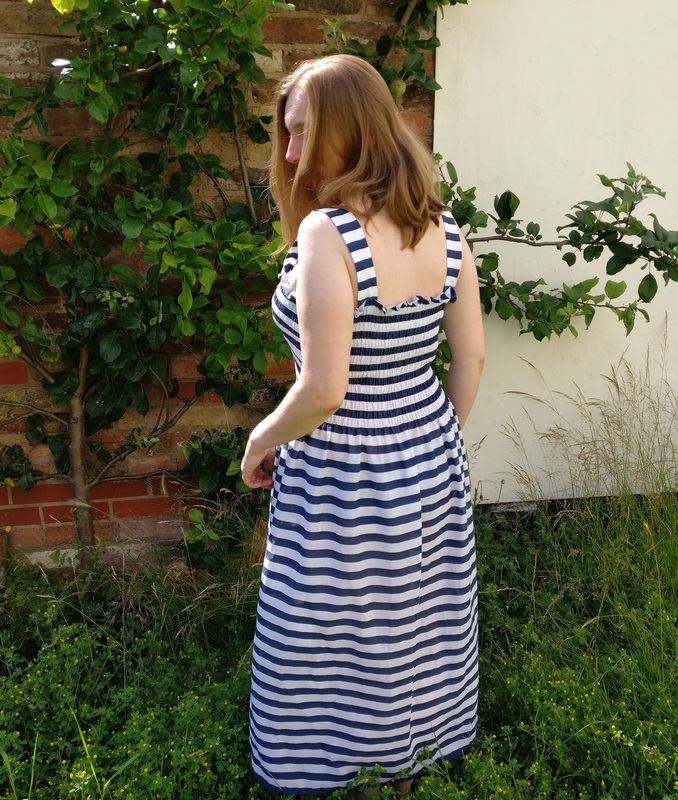 Then I realised that with these larger straps, I wasn’t sure where to put them – and I didn’t see how I could know where to put them to ensure they covered the bra straps, until I’d completed the shirring and basically finished the dress. This led to the construction of the dress being slightly different from that in the book. How many “navies” does one girl need?! Following this, I hemmed the bottom of the dress – so far so good. That sounds so simple, does it not? Well, it wasn’t. 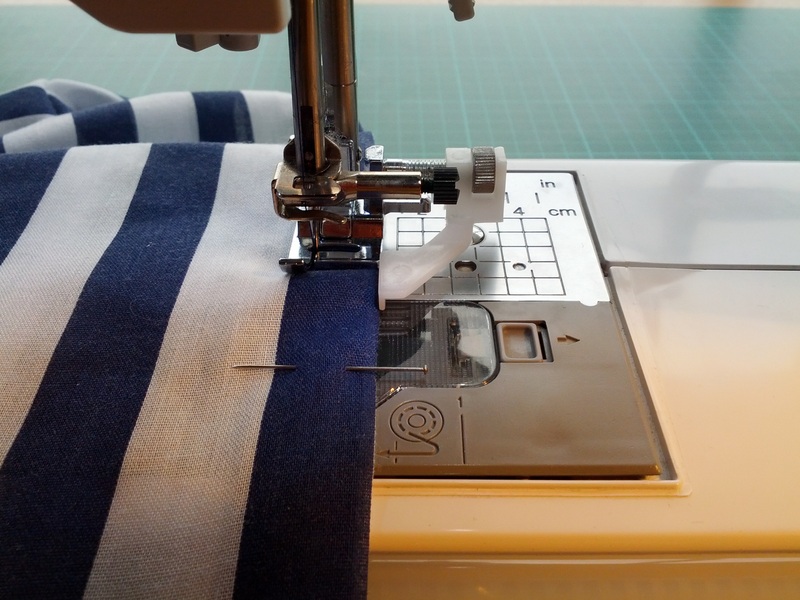 Let’s just say, there’s a reason why you hem the top and then do the shirring – it’s intensely fiddly to fold over the hem when you’ve already got the shirring elastic in – then to add into that, placing the straps in the correct position, and ensuring they’re not twisted? Well, it ended up being thrown across the desk in frustration on more than one occasion! Wonderfully summery. 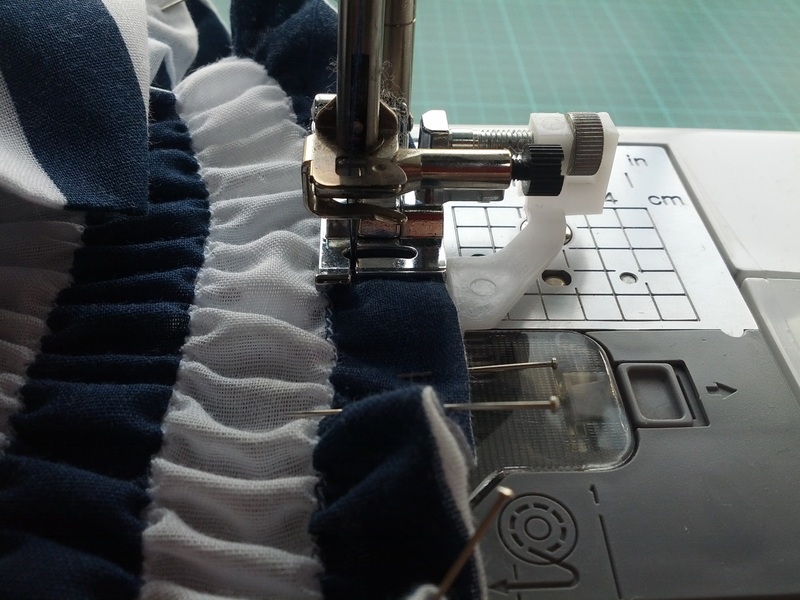 The way the shirring follows the lines of the stripes makes it look “designed” rather than just having run some shirring across the bodice. Very good idea to do the straps wider to cover your bra straps, nowadays nobody seems to mind if their underwear is on show so it shows that I am of an age that preferred to keep it discreetly hidden.